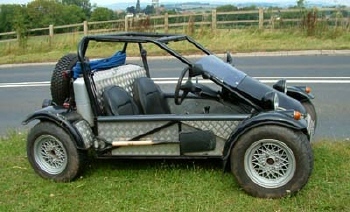 The Freestyle has always been an interesting little kitcar, and its stripped for action demeanor screams utility fun vehicle. 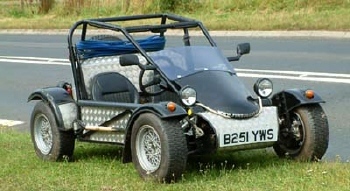 It was originally created by Dave Sewell of well-known chassis firm Fibreform (Ginetta among others), before passing on to a very temporary home with Specialist Sports Cars. After a short while GRP specialists ABS took over and actually sold quite a lot of kits, but it always took very much of a backseat to their primary business of fibreglass panel making. It’s obvious that the Freestyle is a fun little car, based on the humble yet hugely capable Mini, which bestows upon it a certain ruggedness and charm. When equipped with the 1000cc or 1275cc A-Series units the Freestyle is a nippy little character that will etch a permanent smile across your face, oh and (this is very important) it can be built for less than £2000. Bang for the buck just does not come any less expensive than this. Dave took another view that although not a genuine four wheel drive vehicle, it is highly capable when the going gets tough so he’s now found another potentially lucrative market within the off-road hobby. 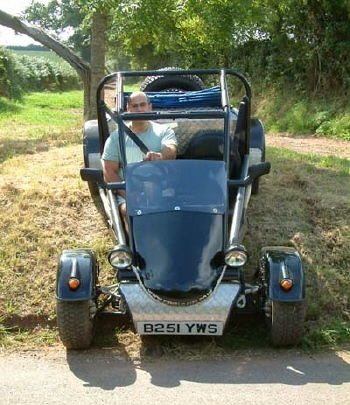 To prove its abilities to me he suggests we have a tool around some local RUPP’S (Road Use Public Paths), and these are like bridleways but require all vehicles using them to be road legal and taxed. These paths are in the main heavily rutted, uneven and would provide a challenge to even the toughest old Land Rover. 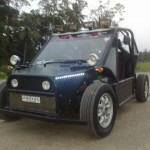 As we enter the first RUPP, Dave launches the Freestyle at it, and to my surprise the car takes it all in its stride and doesn’t get hampered anywhere and makes confident headway with the little 1275cc engine providing ample power, sending the drive to the rear wheels. 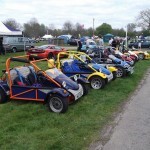 Dave says that he regularly runs rings round acknowledged four-wheel drivers and says that the un-converted veteran ‘green-laners’ initially have a laugh when the little Freestyle joins them, but are soon ‘enlightened’ when it keeps up and surpasses their steeds. 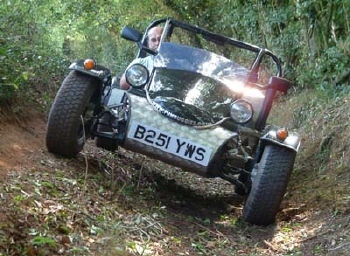 To build the Freestyle you’ll need several packages from Funbuggies, with the main kit priced at £934 inc VAT and for this you get the chassis, pedals, brackets, steering column and suspension top-arms. To this you need to add the galvanised panel set at £111.63 inc VAT, with the five-piece GRP package costing £230 inc VAT, meaning that for a modest outlay of £1275.63 you’ll have the bulk of the components to build a car. Dave has already introduced several options and items to personalise your Freestyle and there are various dress-up parts including a bulbous rear panel moulding as pictured on the red car in our photos, which although not to everyone’s taste does give the Freestyle a distinctive appearance. This costs £200 inc VAT. It actually changes the look of the car quite markedly and will definitely appeal to some customers as it covers up the boxy back end and engine bay, although personally I find that aspect to be one of the cars strongest points. As is often the case with kits of this type the better the donor the better the Freestyle you’ll end up with, but even then £350 will buy you a top notch Mini. 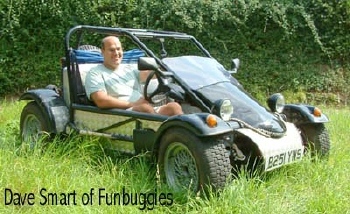 If you’re on a budget you can purchase the kit packages separately, and as mentioned you’ll need to spend a total of £1275 with Funbuggies, which means that allowing for the Mini consumables, £1750 could feasibly see a car completed. Indeed if you know how, this figure can easily be reduced further. For those wanting to use their cars on the road there’s an SVA deluxe kit available at £2350 inc VAT that also adds such items as a lighting set and mirrors. Some of the better Freestyle’s (and nearly every single one is different and highly individual) have featured checker plate and to me this would be an essential item at just £76.38 inc VAT. Any of the ubiquitous little A-Series in either 850, 1000 or 1275cc guises can be used and although the former will give adequate performance, it’s the 1000cc or 1275cc you’ll ideally need as these give sparkling performance. 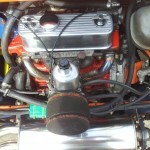 When stripping your donor Mini, the engine is basically lifted out complete with its sub-frame and the whole lot bolted straight into the back of the Freestyle and provides a neat fuss free and highly practical installation. 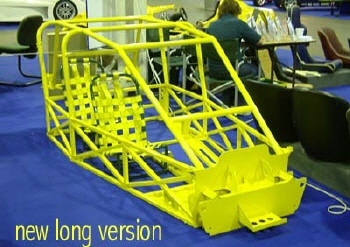 The chassis’ are now made in Tiverton, Devon by the well-respected CKT Aero and Automotive run by Chris Piper, who are a company with a considerable reputation for fine work. It’s here where the ‘Fourstyle’ was created and I think that it will open the cars market up, as it will give four-seat practicality with the addition of 28-inches added to the wheelbase. The unit is fabricated from seamed straight tube and curved CFS before the whole lot is MIG and TIG welded, with the tubes all laser cut. 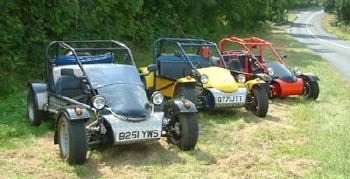 Although prices for the new variant have yet to be set, Dave expects the chassis to cost around £1410 inc VAT. I like the Freestyle and think that it will prosper under the control of Dave Smart and aside from the options already introduced there are several other ideas in the pipeline. 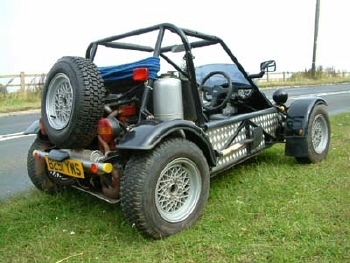 The first to come on stream will be the introduction of the Rover 100 as a donor option, which will only enhance further this great little kitcar, where your imagination is the only limiting factor. It’s always had a load of potential, but for whatever reason was never allowed to realise it.